You can tell a lot about people by their cars, just ask Alice Springs-based Charles Darwin University (CDU) automotive students. They now have access to the latest electronic diagnostics equipment which provides detailed analysis of driving styles, potential issues and even pollution levels of late model cars. In just a few steps, these future automotive technicians can identify issues instantly which their predecessors struggled to find. It’s part of the revolution in diagnostics that sees computers play a crucial role in testing and assessing cars. The Alice Springs campus has just taken delivery of a hand-held diagnostic scanner and five gas exhaust analyser/oscilloscopes which, when combined, cover virtually all aspects of car and engine diagnostics. 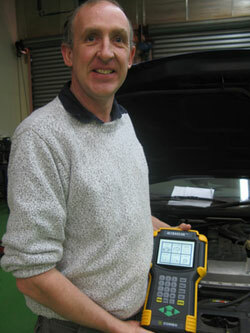 CDU Automotive lecturer Tony Harding said it was crucial students were familiar with new technologies. “This generation has grown up with computers so, for them, it’s like an extension of their home PC,” Tony said. “It’s really important that today’s automotive technicians and apprentices have a clear understanding of how to use diagnostic tools,” he said. The equipment was becoming an essential tool of modern workshops with all manufacturers now offering similar automotive compatibility with their equipment. And Tony said electronics dominated the cost of new cars. “With nearly half the production costs of a new car relating to electronics and software, it’s crucial future students know how to manage it,” he said.